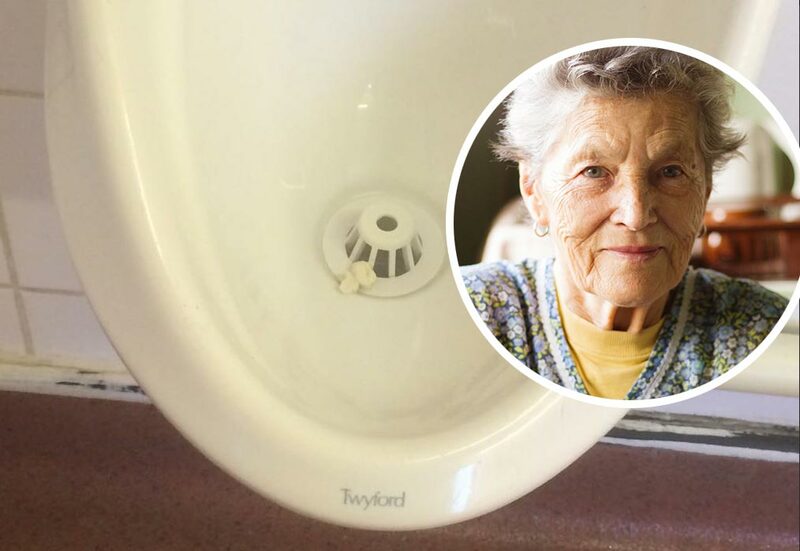 A seventy-two-year-old woman from Ellesmere Port, Viv Thomas, has heaped praise on an unknown man for constantly spitting his chewing gum into a urinal. Viv has a part-time job cleaning a local business centre three days a week, as her pension from her days as a factory worker doesn’t provide her with enough to live on. While Viv enjoys cleaning, she claims the job wouldn’t quite be the same if she didn’t have the thrill of fishing out somebody’s chewing gum with her fingers from the urinal in the gents’ toilet. Viv cleans the Ellesmere Port business centre on Mondays, Wednesdays and Fridays. She mops the floors of the corridors, cleans all of the glass windows and partitions, cleans the kitchen and, of course, cleans the toilets. It’s in the toilets, particularly the gents, where Viv finds her most enjoyable aspect of the job. I love cleaning, but nothing beats the pleasure I get from using my fingers to pick up piss-soaked chewing gum from the urinals. I don’t know who this mystery man is who keeps spitting his gum into the urinal, but I’d like to thank him for not using the bins. He makes my day. Viv isn’t looking forward to her retirement next year as she’ll miss putting her fingers into urinals to pick up sticky objects steaming with piss. Are you the mystery man who spits his gum into the urinal? Let us know in the comments below, we’d love to hear from.